This page contains some general micromagnetics research. 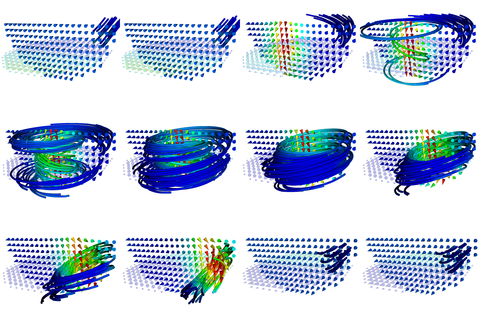 You will also find some of the visualisations produced during some of the micromagnetic simulation runs. Please be patient as some of these images may take some time to load. 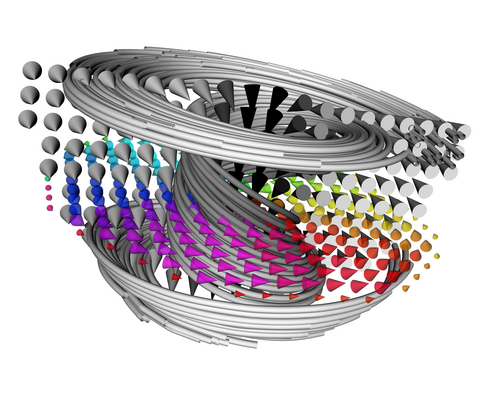 Hosted at NIST, the Computational Engineering and Design Group's uniaxial anisotropy add-in for OOMMF provides a generic Oxs extension object, derived from the Oxs_Energy class which provides uniaxial anisotropy with second (K1) and fourth (K2) order terms. ngtoucd is now part of the magpar distribution and allows the conversion of Netgen neutral finite element mesh files to AVS unstructured mesh format (for use in magpar and other FE tools supporting this format). ovf2vtk is hosted by Hans Fangohr here and allows the conversion of OOMMF vector file formats (including ovf, omf and ohf) to the VTK file format allowing these to be visualised by VTK-compliant software packages. The visualisation below is that of a sphere of radius 200nm at zero applied field. The colour scale represents the angle between the x and y components of the magnetisation; the streamlines represent tracers which have been dropped in to highlight the vortex state. Below is the second derivative of the demagnetisation field of a thin film (height 50nm) of iron-palladium. 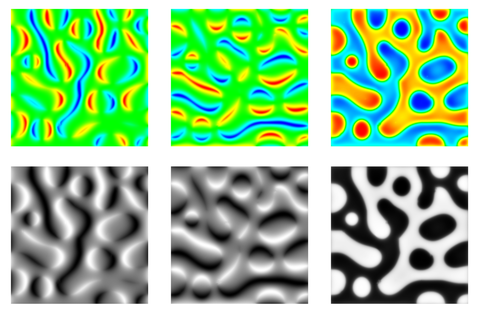 From left to right we see the x, y and z components of the demagnetisation field; the upper and lower images highlight the influence different colour maps have on the data. 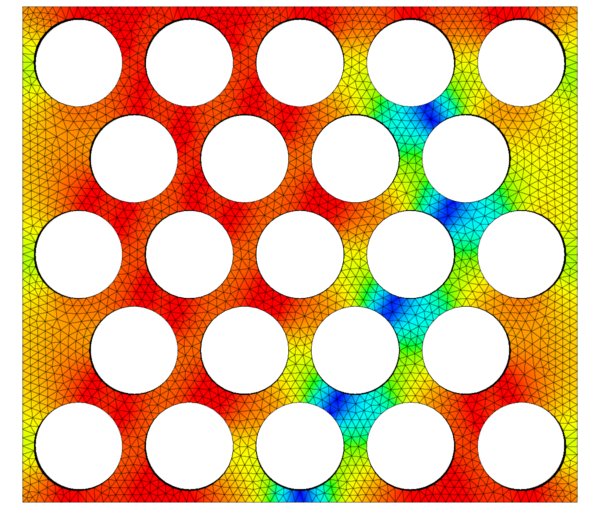 This image clearly shows the bubble domains which form when relaxed from a random initial magnetisation. This image depicts nine spherical holes carved out of a block sample in a similar vein to Boolean objects with CSG in 3D modelling. The permalloy sample is of the size order 600nm x 600nm x 150nm in zero applied field. The colour is representative of the angle between the x and y components of the magnetisation. 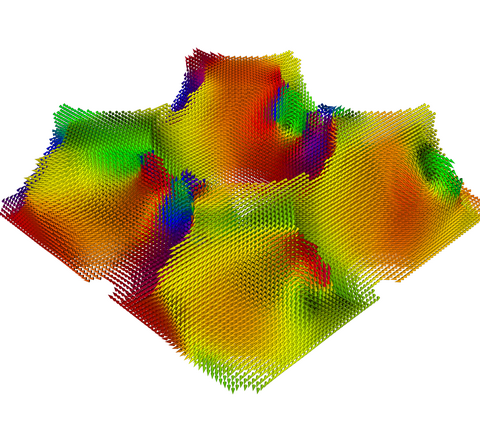 This image shows a slice through the finite element version of the antispheres. 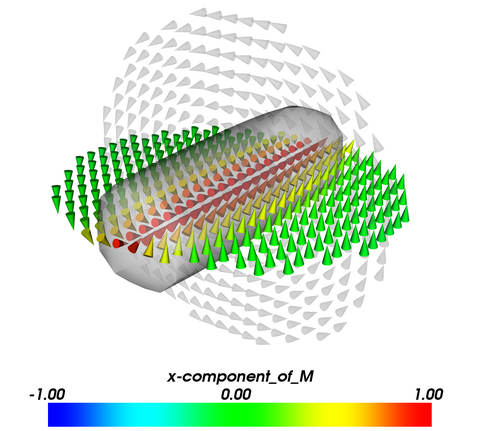 This image depicts a 200nm diameter nickel half-sphere in zero field. Note the out-of-plane vortex which is perfectly central. Again, the streamlines serve to highlight the vortex core, as well as the monochrome cones. The coloured cone plane shows the x-y angle of magnetisation. 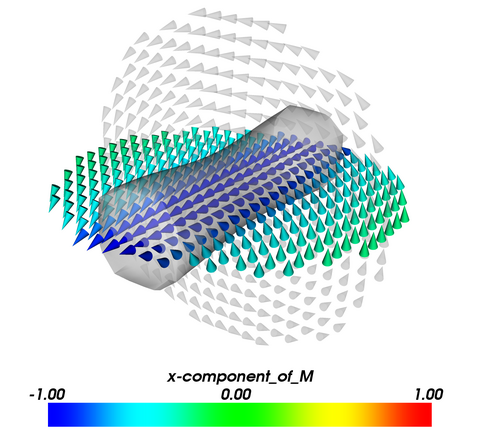 This image uses an isosurface to outline the in-plane vortex in a 200nm diameter nickel sphere in zero field. This is the same sample as above, however it is in a further reduced magnetic field. Note that the core of the vortex has reversed direction whilst the surrounding magnetisation has remained in the same direction. 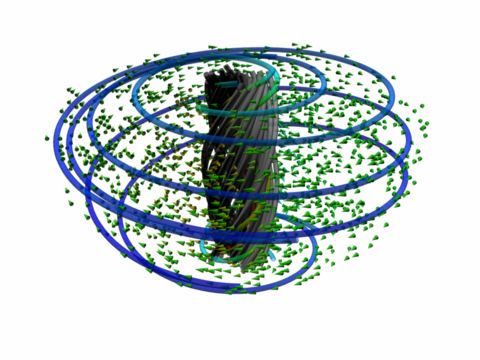 This visualisation shows the vortex which forms in a nickel half-sphere with an ellipsoidal cap of size 200nm at zero field. 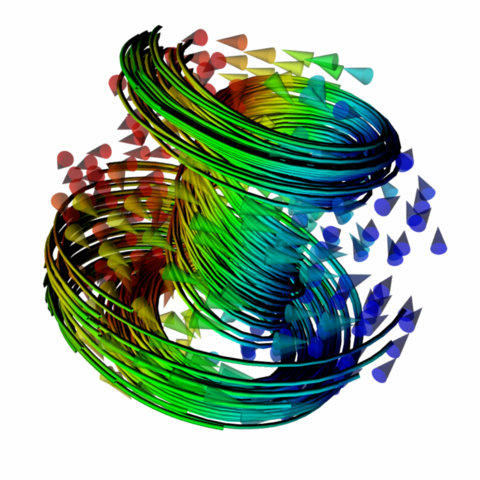 Monochrome streamlines follow the vorticity whilst the coloured streamlines use the magnetisation of the sample as a guide. This image demonstrates the path which a vortex takes as the applied field is swept across the circular plane. Its nucleation point is the third image from the left at the top, its dissipation the second from the left along the bottom. The tracers follow the magnetisation starting from the right-hand side; the colour scheme is representative of the overall curl of the sample. this will cause pimake to fall back to the lintel architecture, which is the closest. -O3 enables all optimisations from the more usual -O2 and adds a couple more. The main thing I'm interested in here is the implied -finline-functions option (i.e. you get it bundled in with -O3) as on balance this should allow the effectiveness of the processor cache to improve. -march=k8 may be aliased/replaced by -march=opteron or -march=athlon64 on your compiler (though I've not thoroughly researched this, sorry). This option enables extensions for the K8 family (MMX, 3dNOW!, SSE etc). -m64 indicates to the compiler that we have a 64-bit environment, so make longs and pointers long. I believe the -msse2 and -mfpmath=sse options are enabled when using an x86-64 compiler, but it won't hurt to tack them in. This should improve stability over 387 code and considerable performance increases. OOMMF doesn't depend on the 80-bit internals of 387, so this won't break anything here. The various texts in the gcc man pages regarding -ffast-math are interesting but come with caveats. I tested the code with and without this option to ensure that a it didn't break and b it gave expected outputs. -fomit-frame-pointer may well be redundant (I believe the O flag turns this on) and I won't be debugging this build. The jury is out on other optimisation options. They may or may not break OOMMF, but they may make it run more quickly. Perhaps the improvement is marginal. Maybe it's great. Let me know if you discover something. Note that this is only valid for Tcl/Tk 8.4 (!) and other versions should set appropriate numbers and library locations. that's it. A tclsh oommf.tcl pimake should now build successfully. Thanks to Dr. Nils Wiese (n.wiese@physics.gla.ac.uk) of the Department of Physics and Astronomy at the University of Glasgow for the following updates to the above. This will allow you to tune OOMMF for Core 2 Duo platforms.